"There'll be a replacement for our Trident system under the Conservatives... The country requires it for its defence." Dr Liam Fox would not set out the exact nature of the deterrent, however, avoiding direct questioning on the number of submarines that would be associated with the deterrent. He repeated however that a nuclear deterrent would be necessary to defend Britain from "nuclear blackmail" by states such as North Korea and Iran. Dr Fox also refused to be drawn on other defence commitments. He said that an incoming Conservative government would have to take account of the "train wrecked" public finances. The Conservatives would, he said, conduct a strategic defence review, define Britain's national interest, the threats we'll face, and then set out the equipment and alliances necessary to meet those threats. A clash with Britain's defence industry seems highly likely, however. Dr Fox is known to be sympathetic to the Canadian model where that country's armed forces are being renewed by purchasing cheaper, off-the-shelf defence equipment from overseas. The Tory leader was speaking at his monthly press conference. On Trident and defence cuts: Mr Cameron was asked on three occcasions about making savings from the defence budget. He said that the Conservative Party supported all of the items currently in the 'forward defence programme' but given the scale of the budgetary crisis would not say if the aircraft carrier and Trident programmes were still affordable. I'm not going to start ruling things in and out, he continued. In the FT this morning David Davis had questioned the affordability of Trident. On today's votes on expenses: Mr Cameron said the Conservative frontbench would abstain from the vote on second jobs disclosure because it is badly drafted, but added that he supports the principle of it. PoliticsHome has more on this aspect. On the 50p tax band: He agreed with Fraser Nelson that the 50p tax band was bad for Britain but declined to agree that it might lose the Treasury money. He didn't know for sure, he said. In a follow up question Fraser Nelson said that rich people would not change their plans and move abroad if they knew that the 50p band would be repealed by a Conservative government. Mr Cameron said that he would not make a commitment now and that 50p would have to join a queue of other bad Labour measures that the Conservatives wished to repeal. On working with Nick Clegg: He said that yesterday's victory on Gurkhas was hugely important and said that the Conservatives will work with the Liberal Democrats on issues of common interest, such as the environment, strengthening local govenment and opposing the surveillance state. On Obama's first 100 days: He declined to comment on the American President's domestic policies but paid tribute to a "pretty successful" foreign policy. He highlighted an end to torture, the promised closure of Gitmo, the re-engineering of strategy in Afghanistan and engagement with Iran. On Margaret Thatcher's thirtieth anniversary: I asked if he would be marking the anniversary in any way and if he was studying how she prepared for government... As Mr Cameron started to answer a military band started playing and marched past the window... Mr Cameron credited Andy Coulson with arranging the march past! After the journalists' laughter had died down he said that the best way of honouring Margaret Thatcher was to elect another Tory government. Yes, he was studying the period - the things she got right but also the things that were wrong including the decision to honour Labour's public pay commitments from the Clegg Commission that delayed the necessary fiscal adjustment until 1981. Following exchanges over the issue at PMQs earlier, a vote has just taken place during an Opposition Day debate initiated by the Liberal Democrats in which the Government was defeated on settlement rights for Gurkhas. MPs voted by 267 to 246 in favour of a motion that the government should extend an equal right of residence to all Gurkhas. Paul Waugh notes that David Cameron and Nick Clegg made a joint appearance outside the Commons in the wake of the vote, which is the culmination of a long campaign, highlighted here last week. The actress was responding to Labour's bureaucratic plan for the settlement of Gurkha soldiers in Britain. Ms Lumley says that Labour's criteria for settlement will be impossible to meet for "ordinary Gurkhas". Watch the video in full. Well worth it. > Click here for the website of the Gurkha Justice Campaign. The Daily Telegraph today publishes key extracts from a speech that Sir Malcolm Rifkind has given on his hope for a "Global Zero"; a nuclear free world. "If we can reduce the current number dramatically, and radically improve verification and inspection, we will have started a process that could lead to zero; we will have ensured the continuation of the Non-Proliferation Treaty, which the vast majority of countries respect and observe; we will have made it much easier for the Security Council to put successful pressure on North Korea and Iran; and far more difficult for terrorists to get their hands on fissile material. That would be a historic achievement – and one that our children and grandchildren would most certainly thank us for." "If the United States destroyed all its nuclear weapons but Russia, secretly, retained one or two, it would have the power to blackmail Washington without fear of comparable retaliation." The difficulty of verification means and the ease with which nuclear weapons could be 're-acquired' by hostile powers means that all talk of complete disarmament is unhelpful. As Margaret Thatcher said in 2000, nuclear weapons cannot be disinvented. Leading Tory politicians would be better advised to support American investment in missile defence systems. The Obama administration has sent out conflicting signals on its commitment to continue President Bush's deployment efforts. "From January 2003 to December 2006, 2,333 regulars and reservists who served in Iraq during Operation TELIC were managed by the Defence Medical Services for mental illness attributed to their deployment. In 2007, there were 1,898 new referrals to the MoD’s Departments for Community Mental Health (DCMHs) who were diagnosed with a mental health disorder and had served in Iraq or Afghanistan or both in 2007. I fear that, deployment after deployment and year after year, the mental health problem will become a mental health crisis. This is because our armed forces are operating at a tempo for which they are neither resourced nor manned. There are some service members who have been on multiple deployments to Iraq and Afghanistan. Each deployment only makes matters potentially worse for the service member and studies have shown a nexus between the length of time on operations the possibility suffering from some form of mental health illness. In the U.S., a recent study found that soldiers on their third or fourth deployment have significantly lower morale, more mental-health problems and more stress-related work problems. In the UK, a report in the British Medical Journal reported that of those troops serving 13 or more months in a theatre of operations, 5.2 percent suffered from PTSD; 21.8 percent suffered from psychological distress and 23.9 percent suffered from severe alcohol problems." Dr Fox promised to build a "land fit for heroes" and promised investment in support services for servicemen returning from duty. Full speech here. 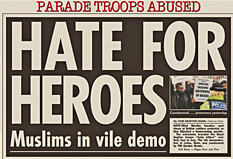 Soldiers returning from Iraq - and marching through Luton as part of a homecoming parade - were greeted with banners branding them as "butchers, war criminals, murderers, terrorists — and baby killers" by Islamic extremists. Inayat Bunglawala, of the Muslim Council of Britain, told The Express: “This was a very offensive protest by a tiny number of known extremists who should not be allowed to tarnish the reputation of Luton’s Muslim community." "Our brave troops have enough to put up with as they risk life and limb in Afghanistan and Iraq. To top it all, now they fly home to vicious abuse from Islamic fanatics. The Royal Anglians had to face a chanting mob waving grotesque placards accusing THEM of terrorism and child murder. Astonishingly, this despicable demo went ahead with police approval. When it turned predictably ugly, who did our brave bobbies arrest? Not the extremists who started the trouble, but a couple of locals who rallied to Our Boys’ defence." What do readers think? Should the police have approved this "despicable demo"? I think not. It was the wrong time and wrong place for such protests. Should the Conservatives abandon the inheritance tax cut? Should the upgrade of Trident be scrapped? Can we afford National Citizen Service? "Their proposal to cut inheritance tax should, in particular, be abandoned. This policy was a tactical masterstroke when announced in 2007. It is also inexpensive. But slashing the duties owed by millionaires on unearned income will make it politically harder to sell the severe and unpleasant structural tightening for which – if they are a successful administration – they would be remembered." Responding to a recent question from Jonathan Isaby the Tory leader said that he would NOT abandon the pledge. The calculation at the top of the party is that the now cheaper pledge would be too difficult to unwind - certainly in respect of the political aggravation that it would cause. But is cutting inheritance tax the right thing to do in such changed economic circumstances? "The money that Brown intends to spend on renewal could be diverted instead to aircraft carriers, cruise missiles and unmanned aircraft, all of which have awesome destructive power and almost certainly will get used. It is to be hoped that the Conservatives are thinking the issue through. For that matter a different US administration might also believe that Britain would be a more useful ally if it spent less on Trident but could unleash more explosive and fly more missions in the next regional war than it did against Iraq." By not renewing Trident the Conservatives could both strengthen conventional firepower and still have some change left over for reducing government debt. This is a flagship David Cameron idea but is it now affordable? By scrapping/ delaying something so closely identified with his personal mission, the Tory leader would be signalling the seriousness of the budgetary situation. I do not know conclusively what I think about each of these three suggestions for saving money but I do think that this is the sort of tough thinking that is now necessary. It's a relatively quiet news day, but the one issue which has been exercising politicians is the Government's quiet sale of its remaining share in the Aldermaston Atomic Weapons Establishment, as featured on the front page of today's Independent. Shadow defence minister, Gerald Howarth, has taken to the airwaves to condemn the move, suggesting that the Government must be "strapped for cash" and that by failing to announce the move to the House of Commons it is "holding Parliament in contempt in respect to Britain’s nuclear capabilities". “It has even been announced here. Parliament hasn’t been told. There has always been a reluctance by this Labour government to be open and frank about issues to do with the nuclear deterrent. What we want to know is what are the strategic implications of this. "Membership of the Royal British Legion is no longer limited to current and former members of the Armed Forces but is now open to all." Shadow Defence Secretary Liam Fox has written to every Tory MP pointing out that membership of the British Legion is now open to everyone and encouraging them to sign up. You can join too. A PDF of Liam's full letter. Earlier today Belfast hosted a homecoming parade for the Royal Irish Regiment. "In Ireland the British Army is responsible for the use of lethal force, shoot-to-kill, the use of rubber and plastic bullets, collusion, internment and torture — all with official impunity." "For the past six months the 1st Battalion, Royal Irish Regiment, has been deployed on Herrick 8. Their immensely difficult job was to mentor and assist the Afghan National Army in all aspects of its operations. It is vital for the future security of Afghanistan that a non sectarian army is created. This immensely difficult work has been carried out by people from across the community in Northern Ireland and a good number from south of the border. With horrible symmetry two friends were injured, one a catholic from Dublin the other a protestant from Belfast. Over 70 have been injured and tragically, Ranger Justin Cupples was killed days before the end of the tour. Our thoughts will be with his family and friends as we celebrate our troops’ return." Read a PDF of Owen Paterson's full article. Since British intervention in Afghanistan began, the Conservatives have criticised the poor pay and equipment for her Majesty's armed forces in strong terms as a breach of the nation's covenant with our troops. As David Cameron looks closer to power than any Tory leader for over a decade, he has become increasingly clear in his pledge to put this right once in government, hinting at various measures that may entail higher defence spending. After meeting troops in Afghanistan, Cameron has today announced that the Conservatives will tackle the issue of lost leave - under which soldiers' rest periods are counted from the moment they leave the field, including all delays in flights home. He endorsed the recommendations of Simon Weston and Frederick Forsyth that the leave be counted only from the moment they arrive home. "Today when our servicemen and women end their duties in the heat and dust of Afghanistan or Iraq, their leave starts not when they arrive home but often after several days delay in trying to get home. Under our plans, the leave clock would not start ticking until they arrive back on British soil. This is a common sense idea that will make a big difference to the lives of our brave troops and their families. "I think this is fair for our troops. They should be able to predict how long their leave is going to be rather than having to spend it on an aeroplane and on air bases a long way from home." Liam Fox has warned regularly in his capacity as Shadow Defence Secretary of how under-funded the armed forces have been, noting in March that the army, air force and navy are now sufficiently small that every single serviceman will be able to fit into the new Wembley Stadium. The main story on page one of this morning's Times alleges a "Secret deal kept Army out of battle for Basra". "Outrageous" is the word Liam Fox uses within a letter that he has just sent to his opposite number, Defence Secretary Des Browne. The letter seeks clarification of whether British intelligence did strike such a deal. The full text is pasted below. If true, it is another humiliation for the British military. Our troops have fought bravely throughout the conflicts in Iraq and Afghanistan but their political direction has been consistently poor. Basra was dominated by criminal groups when Britain retreated and it took the Iraqi armed forces - backed up by US troops - to start to turn that situation around (and here) in what was called Operation Charge of the Knights. The humiliation is doubly depressing if our absence from that Operation wasn't for strategic reasons but because of a shoddy deal with Iranian backed terrorists. When will civilised nations learn that dealing with terrorists only invites more terrorism for the future? Over at Coffee House, Daniel Korski looks at how Prime Minister Cameron might operate (should he be elected!). He suggests that Mr Cameron might appoint a new Cabinet-level Secretary of State for Veteran Affairs (entirely consistent with the Cameron-Fox emphasis on these issues) and also a Secretary of State for Climate Affairs. We like the first idea and hope the second idea is unfounded. Prime Minister Cameron is rumoured to be considering restoring Ken Clarke to the Cabinet. He will also decide if he wants to restore other big beasts to the frontbench. David Davis, Iain Duncan Smith and John Redwood are some of the party's biggest hitters. Prime Minister Cameron's first one hundred days is the focus of the final part of Andrew Grice's five-part series on Project Cameron this morning. Mr Grice notes the importance of the Implementation Unit under Francis Maude and the Tories' determination to hit the ground running from day one. Although Labour carried out big changes in their early days in power - like Bank of England independence - their more difficult reforms on schools and hospitals, for example, were delayed. David Cameron doesn't want to repeat that mistake and centrepiece reforms on schools and welfare will come early so that the benefits also come early. There must be a risk, however, that Labour will leave the economy and public finances in a mess. George Osborne's first budget could define the early Cameron years in the same way Geoffrey Howe's budgets defined the Thatcher years. Mr Cameron won't rush to reverse the Hunting Ban (via a free vote). This will probably be a second year action. The Conservatives will want to appear focused on the bread and butter issues facing the nation. A guaranteed NHS dentist for service families even if the lists in the areas they move to are full. Passporting of their place on NHS waiting lists so that they do not start waiting all over again when they move from one NHS jurisdiction to another. Extra investment in pre-school childcare and after school clubs. Extra education funding for servicemen's children; the report finds problems of underachievement related to constant changing of schools. Faster refurbishment of service families' accommodation. A new system for compensating injured soldiers so that "functional impairment rather than a formulaic assessment of individual injuries" determines payments. The report's recommendations will now go to Dr Fox and the shadow cabinet for consideration. Sell parts of the defence estate to improve service housing. Place greater pressure on Nato countries to contribute troops and cash to the war in Afghanistan. Hold a Strategic Defence Review. Conservative Party members have voted for the defence budget to be an incoming Conservative government's number one expenditure priority. ConservativeHome's Samuel Coates will be at today's Forsyth Commission launch and will report more afterwards. "Americans must realise that NATO must maintain its primacy in European security, and that any advancement of EU military capabilities must be done wholly integrated, not as a pillar, into the current framework of NATO—in support of NATO’s aims and objectives." Download a PDF of the full Fox speech on NATO.